Feni madrasa girl Nusrat Jahan Rafi’s brother has get job in NRB Global Bank as a trainee officer. 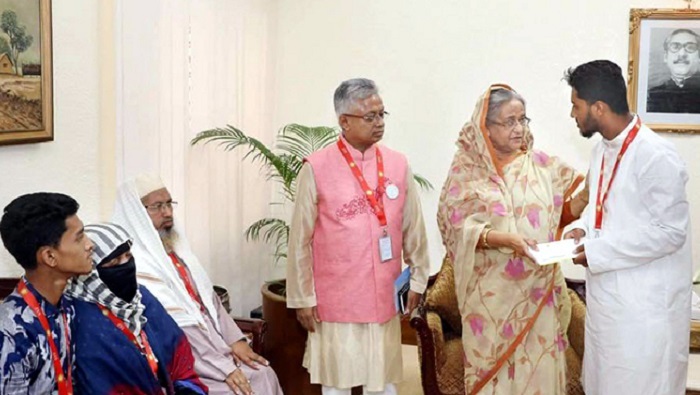 Prime Minister Sheikh Hasina on Monday handed over the appointment letter to Nusrat’s brother Mahmudul Hasan Noman. Nusrat’s family members—father AKM Musa, mother Shirin Aktar along with two brothers—meet PM Sheikh Hasina at her office on Monday morning. The premier expressed consolation and deep sympathy for the Nusrat's family and assured them of all kind of supports. Nizam Chowdhury, Chairman of NRB Global Bank told journalists that Noman has been appointed as per PM’s direction. Noman will join as a trainee assistant officer at Sonagazi Dak Bungalow Branch after his degree exams results will be published. PM Sheikh Hasina also asked me to take special care to Nusrat’s family, Nizam Chowdhury added.